If you’ve read my other posts about the Sahara you’ll know I spent a lot of time looking into this. If you want to ride a camel through the Sahara desert and sleep under the stars, this post is for you. I apologize for the length, but I’m anything if not thorough! First – you have 3 options for locations to do camel treks in the Sahara Desert – though in reality one of them is not worth even bothering with, so it’s important to know the difference. There are 2 different large moving sand dunes in the Sahara where people go to do Camel Treks with the Berber People: Erg Chebbi (in Merzouga) and Erg Chigaga in Zagora. 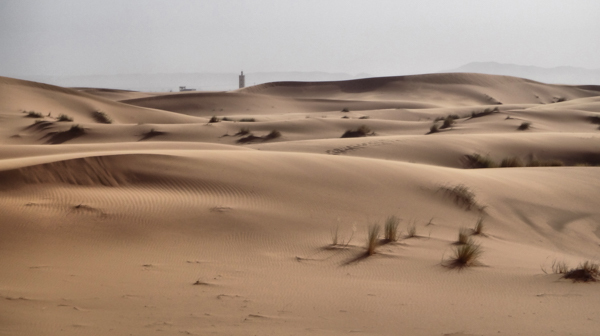 The problem is that Erg Chegaga is only reachable via a 3-4 day trek, so most tours do a 1 day stop in Zagora without visiting the actual dune. You end up seeing high desert, which just doesn’t have the same look or meet the expectations you might have of what the Sahara should look like. Erg Chebbi is right by Merzouga, so if you have to pick, and you don’t have the time available to properly go explore Erg Chigaga, go to Erg Chebbi (which also happens to be the largest of the two, though Erg Chigaga is more remote, offering a more authentic taste of Berber life). 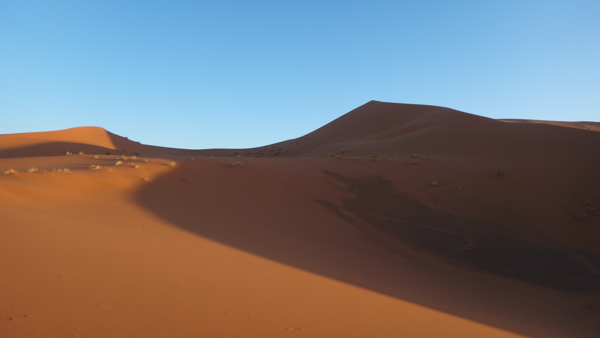 Assuming you choose to go to Erg Chebbi in Merzouga (which is where we chose to go), you have essentially 4 ways of getting there, each one with different costs associated..
A) Book a Group Tour – this will cost around 900Dirhams ($120) per person. B) Book a Private Tour – this will cost around 3,500 Dirhams ($500) per person. A) Take the Supratours Bus out of Marrakesh at 8:30AM. It’ll take 12.5 hours, you should be in Merzouga by 9:00PM. Not sure on the price but it’s pretty cheap to travel within Morocco on buses and trains. 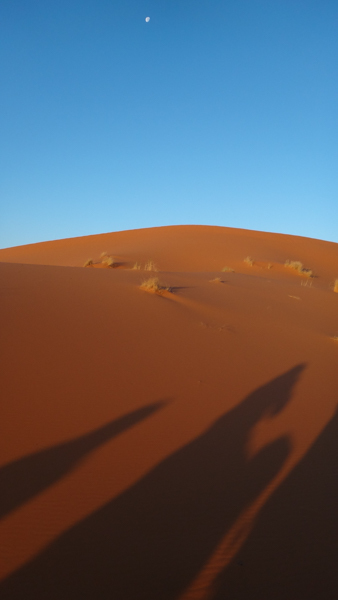 Camel treks leave mid afternoon so you’ll have to spend the night in Merzouga and depart the following day for your desert trek. B) Break up the journey and stop in the same places as the packaged tours do. There’s a great sample itinerary over at this blog. Super cheeky Money Saving Tip: Save 3 nights accommodation by heading from Marrakech to Fez first (if it’s in your itinerary) as it’s a night bus. Spend a couple days in Fez, then take the night bus from Fez to Merzouga. Explore Merzouga for as much or as little time as you want, and then take the night bus back to Fez. Boom – you just saved yourself 3 nights of accommodation. This will cost you around 250-350 Dirhams per day for the rental ($35-$45) with unlimited kilometers, plus the cost of gas (around $1.25/liter), so assuming you get a small basic car with A/C (you’re definitely going to want it!) the consumption is about 7 liters per 100 kilometers. The route to Merzouga is about 750 km, but we rounded up to 1000km with possible stops and detours for exploring. This means an extra $87.50 for gas. Plus, if you want to leave the car in Merzouga rather than drive it back to Marrakesh you have to then pay for someone to come down and drive the car back up. We were quoted 1,100 Dirhams for this (so around $150). That means for 3 days you’d be paying around $310, without factoring in food or accommodation. There’s a great route description/plan over on this lonelyplanet forum post. 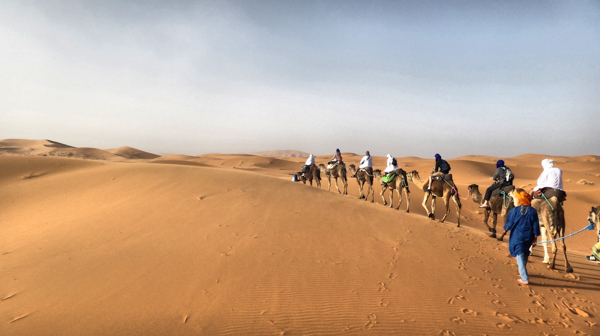 If you go with options 2 or 3 then you’ll need to arrange your own camel trek when you arrive in Merzouga. This is very easy to do, and should cost around 300 Dirhams per person for a 1.5 hour camel ride into a Berber camp, an overnight stay including dinner and accommodation (basic), and a return the following morning. There are people offering these tours all over Merzouga, so you don’t have to have anything planned before arriving – in fact it’ll likely be cheaper if you don’t book anything until you arrive. You can check on Couchsurfing.com for someone to stay with in Merzouga, who will also arrange a tour for you – but be aware: it seems that the Moroccans haven’t quite gotten the spirit behind couchsurfing and most expect some sort of compensation for providing you with accommodation for the night. In fact, the majority of the people offering accommodation in Merzouga are offering it in order to promote their camel trek tours, so be very upfront and ask about what the expectations are. I read lots of negative accounts where couch surfers got a rude awakening when payment was demanded of them. Check the reviews of the host. I even went as far as contacting some of the reviewers who had been disappointed with their experience and one told me he felt the whole thing was very much a canned tourist experience, and that he felt pressured to go on a camel trek because of his host. Even with this in consideration, most people reported very positive experiences in the host’s couchsurfing profile page saying that they were picked up from the bus station and welcomed like family. That’s it – those are all the ways to get to Merzouga (short of flying there) and how to plan a camel trek once you arrive. Make sure to read our other posts about the sahara for an in depth review of the tour we did, and what we thought about the experience.